Belfast International Arts Festival is delighted to announce its first two headline acts for 2018’s biggest contemporary arts event; ‘Africa’s premier diva’ Angélique Kidjo and folk and blues legend Eric Bibb. Audiences are being given the chance to book the best seats in the house with the world class musicians performing back to back in the Grand Opera House. 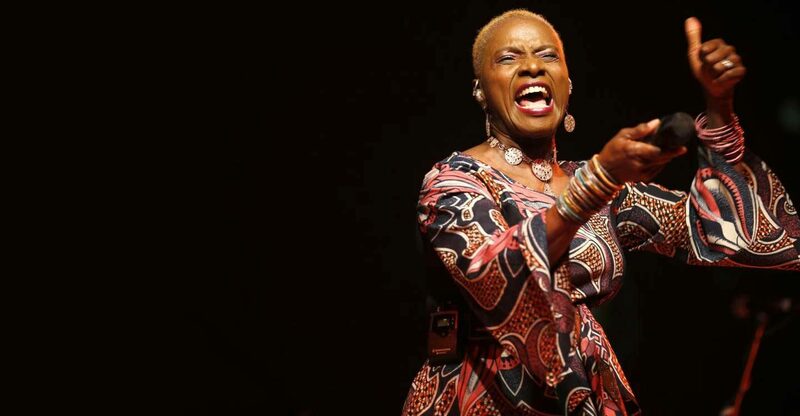 Kidjo will take to the stage on 29 October, followed on the 30 October by Bibb. One of the Guardian’s ‘Top 100 Most Inspiring Women in the World’ and three time Grammy winner Beninese singer-songwriter, actress and activist, Angélique Kidjo will perform her latest work, an interpretation of The Talking Heads classic 80s album, ‘Remain in Light’. Having partnered with super producer Jeff Bhasker (Rihanna, Kanye West, Harry Styles, Bruno Mars, Drake, Jay-Z) for the unique version of the album – Angélique reclaims rock for Africa, bringing to the stage euphoric singing, explosive percussion, horn orchestrations, and select lyrics performed in languages from her home country. Bibb’s new work has been called “classy and consistent”, “uplifting” and “inspiring” with a spiritual aspect indelibly etched into its core. These two spectacular events will be part of the annual Belfast International Arts Festival taking place from 16 October to 3 November and featuring artists and performers from home and abroad for a world class programme of theatre, performance art, visual art, dance and music. Festival Director, Richard Wakely, is looking forward to the 56th edition of Ireland’s leading contemporary arts event. “These two signature concerts from two of the world’s greatest musicians reflect a changing, exciting and culturally vibrant city and our enduring love of music from all traditions and backgrounds. To be able to present such critically and popularly acclaimed artists such as Angélique Kidjo and Eric Bibb is a real honour for us and a treat for music lovers everywhere”. Tickets are available now from via the Grand Opera House Box Office online or by phoning 028 90 241 919. Book both performances and save 10%.